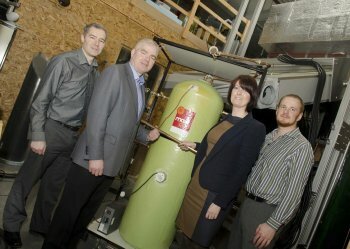 The University of Ulster’s Centre for Sustainable Technologies (CST) is helping one of Northern Ireland’s fastest growing independent manufacturing companies ‘copper fasten’ its reputation as a leading supplier of hot water tanks. Toomebridge based firm, Copper Industries (Ireland) Ltd manufactures and supplies a variety of hot water copper cylinders, calorifiers and combination units, ranging from the traditional hot water cylinders to the more innovative solar vented and unvented cylinders. Almost a quarter of domestic energy consumption in the UK is currently attributed to domestic water heating and, with fuel costs spiralling, there is growing demand for more effective and efficient hot water storage systems. With a proven track record of introducing new products to a growing market, Copper Industries was keen to make the most of emerging market opportunities and took advantage of Invest Northern Ireland’s Innovation Voucher programme to access CST’s technical expertise to develop a cheaper and greener way to store hot water. The CST team, which is based at the Jordanstown campus, is headed by Dr Mervyn Smyth and Mark Anderson. They carried out short-term testing of one of Copper Industries signature products, the Maxi-Pod Thermal Storage System, testing under a range of indoor operating conditions, comparing its performance within a range of flow rates and temperatures. Having completed a first Invest NI Innovation voucher, the company then successfully applied for a second one. The results of the research undertaken by the CST team for Copper Industries are now being used to develop technical specifications for the company’s marketing and promotional material. Mark Anderson explains: “The second Innovation voucher project focused on the development of tank temperature profiles under various operational conditions for their newly designed novel hot water cylinder which is hoped will improve delivery and the use of energy from solar hot water systems. As part of its ongoing commitment to innovation, Copper Industries then collaborated for a third time with the Ulster academics, this time to establish a Knowledge Transfer Partnership (KTP) programme. The KTP programme, due to commence later this year, will establish ‘in-house’ research and development facilities at the Toomebridge factory. Mr Anderson explains that up until now, any product development by the company was based on experience in the plumbing industry and trial and error. “This new two year alliance will facilitate the development of a research facility at the company’s premises to test and scientifically analyse the performance of future innovative hot water concepts and new and emerging materials and technologies. The Innovation Voucher programme at Ulster is managed by the University’s Office of Innovation. Commenting on the relationship with Copper Industries and the way that the company had progressed from Invest NI’s Innovation voucher programme to the KTP programme, Business Liaison Manager, Kerry Patterson said it was a great example of how collaboration on a smaller scale could lead to larger projects. This month marks a major milestone for the Innovation Voucher programme with the successful completion of the University of Ulster’s 200thvoucher project. Projects to receive assistance from the University of Ulster under Invest NI and Enterprise Ireland’s Innovation Voucher programmes include: fire and skid resistance testing; optimising product shelf life and food labelling; the design of recycled plastic structures; the testing of the performance of a sports drink and the development of a prototype virtual learning environment. Commenting on the benefits of a collaborative partnership with the team at the University, Charlie Shivers, Managing Director of Copper Industries said that being able to test a new product at low cost gave the company the confidence to move forward and invest in a product that is now being used throughout the UK and Ireland. Caption: From left to right, Dr Mervyn Smyth, School of the Built Environment, Centre for Sustainable Technologies,Charlie Shivers, Managing Director, Copper Industries (Ireland) Ltd. Kerry Patterson, Office of Innovation and Mark Anderson, School of the Built Environment, Centre for Sustainable Technologies with the Maxi-Pod Thermal Storage System.